The bed is designed to mount on any truck. · Deck, hitch trough, and head board is constructed of Gavannealed Steel plate with spray on bedliner coating. · 5 wide polished aluminum fenders. · Polished aluminum treadbrite rail caps on side rails and headache. · Polished aluminum treadbrite on side rails on inside of headache uprights and bottom of headache cross member. · Two paneled doors on each of two storage boxes is Polished aluminum treadbrite. · Storage box are lighted when doors are open. · Each bed has a Class 5 receiver hitch. · One 7-way Rv Trailer receptacle and one 6-way standard Trailer receptacle wired and mounted in the hitch trough. · Each bed has two working lights mounted on the underside of the headache cross member. · Each bed has twelve running lights installed as follows: six rectangular amber light, three on each side; two small amber lights, one on each side; two rectangular red lights, one on each side; two small red lights, one on each side. · Each truck will have a hitch plate to support 30,000# capacity ball or hitch mounted to the frame with eight Grade 8 fasteners. 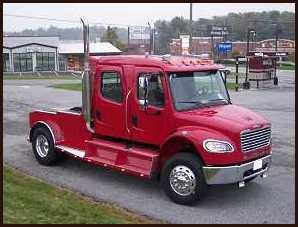 · Each truck will have a 60" cab to axle or a 74" cab to axle. 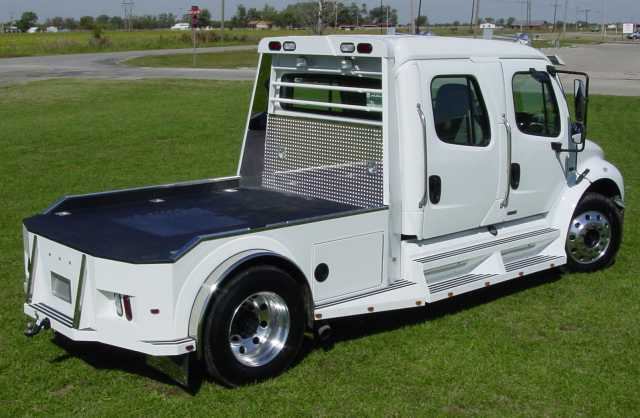 · Any truck with a diferent cab to axle measurement will be considered a custom bed. Cowboy Cadillac Offer all of the products listed below!